Laser Safety goes under the ANSI 136.1 standard in the United States and the EN207/EN208/EC60825 standards in Europe and Australia. 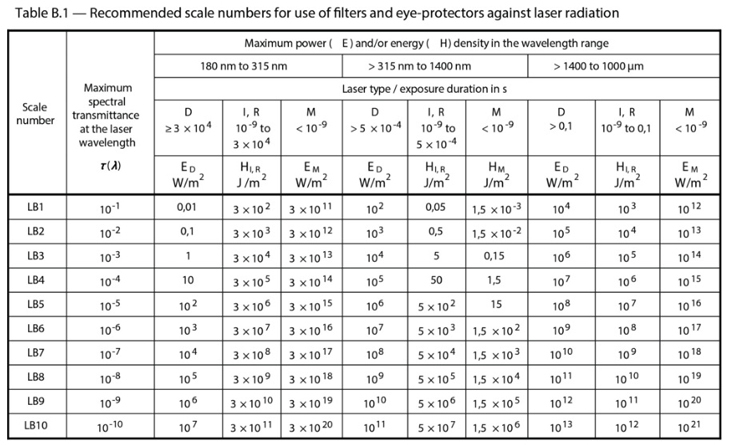 Lasers are categorized by the ANSI Z136.1 standard into the following categories. NOTE: The category alone is not enough to work out which eye protection is required. 1 Non-hazardous Eyewear not required. 1M Eye safe visible laser (400-700nm) if used without magnifying optics. Eyewear not required unless used with magnifying optics. 2 Eye safe visible laser (400-700nm) (safe within the blink reflex of 0.25s). Eyewear not required. 2M Eye safe visible laser (400-700nm) (safe within the blink reflex of 0.25s) if used without magnifying optics. Eyewear recommended. 3R Likely unsafe for intrabeam viewing. Maximum Permissible Exposure (MPE) is up to 5 times class 2 limit for visible lasers of 5 times class 1 limit for invisible lasers. Eye hazard; eyewear is recommended. 3B Eye hazardous for intrabeam viewing. Limited diffuse hazard. Eye hazard; eyewear is recommended. 4 Eye and skin hazard for direct and diffuse exposure. Fire and burn hazard. Eye protection and other personal safety equipment is required. ANSI Z136.1 requires specification of laser safety eyewear according to optical densities (OD), and allows a Nominal Hazard Zone (NHZ) to be calculated, outside which diffuse viewing eyewear is allowed. Optical Density (OD) is a measure of the attenuation of energy passing through a filter. The higher the OD value, the higher the attenuation and the greater the protection level. In other words, OD is a measure of the laser energy that will pass through a filter. OD is the logarithmic reciprocal of transmittance, expressed by the following: D? = -log10 T ?, where T is transmittance. European, Australian and New Zealand laser safety regulations EN 207/EN208 consider Optical Density and also the power/energy density (power over time over area) of the laser when determining laser safety requirements. Like ANSI Z136.1, laser safety eyewear must provide sufficient optical density to reduce the power of a laser to be equal or less than the Maximum Permissible Exposure levels (MPE), but it must also provide damage threshold protection (direct hit over a given amount of time/energy). Under EN207, Laser safety goggles must protect against direct intrabeam exposure to the laser. The EN207 standard requires that eyewear is labeled to with protection levels that detail their damage thresholds, (e.g. 10600 D L5 (where L5 reflects a power density of 100 MegaWatt/m2 during a 10 seconds direct hit test at 10,600nm). EN207 L- ratings account for the damage threshold of the eyewear material, i.e., the power density eyewear will withstand, and requires actual laser stability testing for at least 10 seconds (cw) or 100 pulses (pulsed modes). Lasers operating at different modes have different power density characteristics and often different eyewear requirements.